Congratulations to Hakan Hammer of Norway on winning the Dome of the Month contest for January. 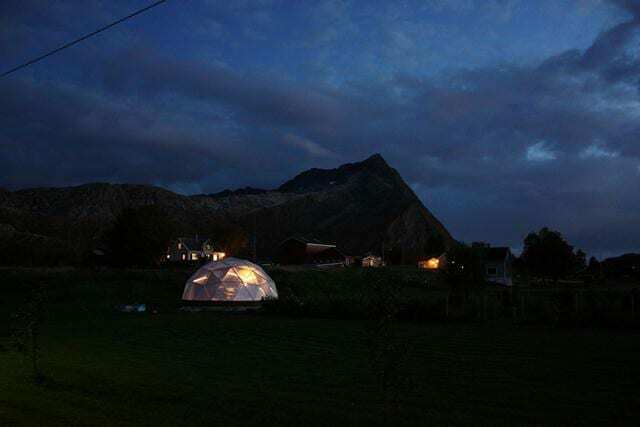 He submitted two gorgeous photos of his 26′ Growing Dome in twilight. We had to choose between the two, which was difficult, so in this blog post we’ll include both for you to enjoy. The first is the winner and the second is most definitely the runner up! I am currently living in Norway and am always admiring your domes. As of yet, I have no place to put the dome, but when I do, I will definately be installing it. However, I see that Mr. Hakan has a dome in Norway already. In embracing the spirit of opening the domes up to other people in April, I was hoping that the administration of GD could contact Mr. Hakan and that he would allow me to see his dome. Thank you for your help, and your hard work in developing this utopia for all seasons.